Alchemy fine Living Fferrone Designs bring you fascinating decor for your home. Crafted using high quality materials, Alchemy fine home was initiated by Vanessa who is a wizard when it comes to interior and event design. Droven by her artistic passion she brings you home entertaining with home decor accessories that turn on the celebration of joy, art and beauty. Read on to know more about Alchemy Fine home and its products. Enjoy absolute free shipping deals and 30-day money back challenge on every order at Half Price Drapes. All their fabrics stitched are perfect where you need not check for any measuring guide or installation care. Alchemy fine home is a luxury home decor online store that offers you excellent products that inspires every corner of your room. From the finest dinnerware to artistic lighting, Alchemy fine home offers you a blend of both classic and contemporary finish that will spice up the look of your home. Here are few of the top products from Alchemy fine home. A vivid collection from Fferone designs, Alchemy fine home is associated with Fferone designs in delivering customers with most exquisite glasswares. Be it for daily or formal dining ambiance, Dearborn collection from Fferone designs is manufactured using prominent quality Borosilicate glass. The best feature of Dearborn collection from Fferone designs is its optimum resistancy for handling hot and cold applications with absolute ease. You can use the glassware’s in oven, microwave and dishwashers. Dearborn Champagne Flute – A set of 2 glasses, the champagne flute is made in Czech republic and comes in (7 fl oz) that is best suited for any occasion. Dearborn Medium/Large Bowl – Suitable for everyday use, these bowls can be used for serving snacks, sauce and what not. Dearborn water glasses – straight from Fferone designs, the crystal clear look makes you drink water everyday rather than gulping it from the bottle. The Fferone designs also offer excellent products such as Doppio cheeseboard, wine goblet, cocktail glasses and presenter set and many more. Alchemy fine home also includes many home decor products such as dinnerware, flatwares, placemats, serving ware and so on. Celebration collections from Alchemy fine home features complete set of dinnerware collections that are paired with tabletop decor such as candles and other accessories. Each and every design are perfected in such a way that they completely absolutely change the perspective of having meals. Let’s take Transatlantica celebration collection for instance. The Translatlantica celebration collection comes with vibrant blue and white procelain design that has a historical meaning. The design depicts the union of blood between Brazil and Portugal that is blended by the mighty Atlantic thus creating a multicultural meaning. Wine stopper that are designed using gemstones such as Moonstone, Malachite etc. Crystal cocktail glasses are available at Alchemy Fine Home that comes with square cut base. You can choose between the double old fashioned or hiball size that comes with ridiculously fantastic spectrum of Moser colors that completely changes the way you choose your taste. Choose from alexandrite, aquamarine, beryl, ocean green, roasalin, eldor, smoke, topaz etc. Axis gold candleholders – made using solid polished brass, the metallic candleholder features a sharp stem that gives the candles a floating look making it an excellent centerpiece. Brass sputnik starburst – Remember the Russian satellite sputnik, its about time to recreate it and bring it back right at your bedside table. Of course, it makes a great decor to your coffee table as well. Made out of satin brass, this starburst sputniks is a must have modern decor at your home. There are designer lightings , mirrors, coffee tables and antique crafted chairs as well that add a luxurious feel to your bedroom, living room etc. So, why should you buy from Alchemy fine home? There are many reasons why you can rely on Alchemy fine home. For starters, the company was initiated by already famous Vanessa Van Wieren. She is a well-known interior and event designer who have received excellent reviews from her previous clients. She has her own sense of style that is clearly visible in the vision she delivers in front of you. Here are some of the reviews put forth by her clients for Alchemy fine events and invitations. These are only few of the clientele reviews. There are many more good words about Vanessa. This says a lot about her credibility and genuineness in delivering excellent products to her customers as well. The company ensures that all the products are quality checked before sending it off to you. They upload many of their decors in instagram and facebook so that you can not only throw a query but also take a second look on the features before ordering on buy. You can also check the reviews what people quote about the products. 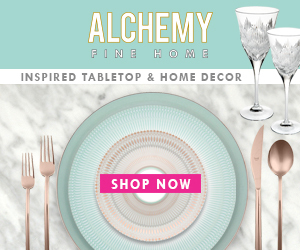 Alchemy fine home offers Free shipping anywhere in USA. The company also comes with 30 day trial period. If you don’t feel the product does not meet your expectations, make sure to return them and get your money refunded (excluding 30% restocking fee). NOTE that you have to bear the shipping charges while returning. You can find Alchemy fine home coupon codes available on many websites. They come with excellent discount and promo codes that will help you to get a cut-off on the original price. Just make sure to paste the coupon code before proceeding towards payment. Frankly, there are not much reviews available about how Alchemy fine home works. However, since the company is initiated by people who have received great reviews from their clients for their vast experience in weddings and interior decor, you can certainly expect a great level of genuinity while dealing with Alchemy fine home. I leave it at your discretion and hope that the reviews suffice.